Historically, our choice of Best Product is a consumer-based item such as 2015’s Winner: Sena 10C camera, and Honorable Mention: Healtech Quick Shifter. For 2016 we’ve chosen a commercial product that has remarkable potential for expanding the reach of motorcycling. 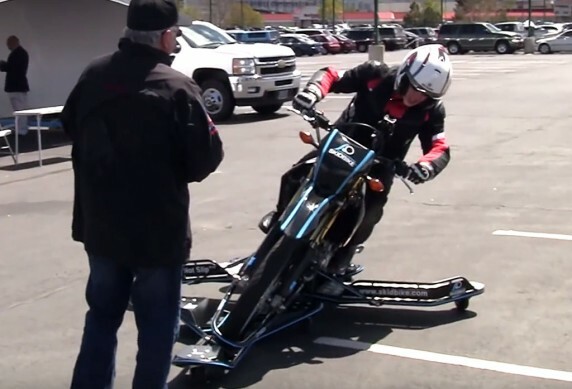 Based on Cedergrens’ Skidcar concept, Skidbike removes the trepidation during the initial stage of a new rider learning to balance a motorcycle while concurrently coordinating controls by eliminating the chance of crashing. The device also allows experienced riders to venture beyond their normal comfort levels to better understand the functionality of modern electronics, or explore the amount of brake pressure that can be applied before the front tire washes out (which is much more than you think). Skidbike resembles a motorcycle with miniature sidehacks attached to both sides riding atop a couple of skateboards, and feels as though you’ve a couple squished shopping carts caught underneath the bike, threatening to tug the bike off its line depending how each caster wheel grabs an uneven section of asphalt. But it works. The outriggers are adjustable to a lean angle of up to 35 degrees. So if the front end of the bike does wash out, there’s a momentary feeling of falling before the Skidbike’s outriggers catches it. A rider can also experience the sensation of reduced traction, such as riding on wet pavement or ice, via the hydraulically actuated components attached to both the front and rear wheels which reduces contact of the bike’s tires from the pavement. 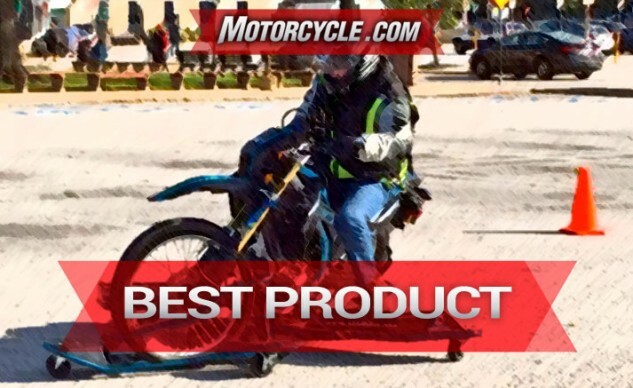 When attached to bikes equipped with modern electronics such as traction control, ABS, and Cornering-ABS, Skidbike provides a way like no other device to test these technologies. Skidbike is not yet widely available within the United States, but hopefully, that’ll change in the near future. You can read our entire Skidbike report here, or on Skidbike’s website, or check out our full report of the 2016 International Driver & Rider Training Symposium. We’ve utilized numerous action cameras over the years. 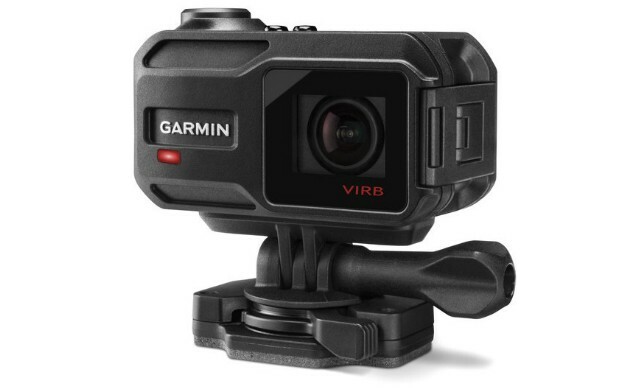 The Garmin Virb XE has proven not only easy to use – especially for motorcyclists wearing leather gloves – but also because it is chock full of technology that gathers information such as acceleration, G-force, elevation, speed, lap times, etc. When downloading video into Garmin’s free video editing software, the additional information tags along and is easy to format via layers within the video editing software. The G-Metrix system is what initially attracted us to the Virb XE. G-Metrix is a combination of a built-in gyroscope and GPS, as well as external Garmin devices for capturing data in the form of speed, heart rate, water depth, fuel consumption, engine speed, etc. For our purposes, we focused mainly on track shape, speed, lap times, G-force, and elevation – all of which do not require any external devices due to the device’s internal gyroscope. Simply power on the camera, wait a minute for the GPS to automatically sync, then it’s ready to start recording both video and data. Using the camera is fantastically easy. You can either power on the camera, ensure your settings are correct and leave it in standby until you’re ready to record, which is triggered by moving the lever on the right (with the small red dot) forward. Or, even if the camera’s powered down, flipping the red-dotted lever forward will automatically turn on the camera and begin recording. Pushing the center button commands the camera to take a still photo. Both are really cool features that are easy to operate while in motion and while wearing gloves. A choice exists with Virb cameras between the X and XE models. Price is the most obvious factor: $299 for X and $399 for XE. What you get for the extra Benjamin with the XE is electronic image stabilization, upgraded video that will shoot in 1440P, and a wider variety of frames per second selections in other formats, which is good for high-speed events (like motorcycle track testing). Otherwise, the X and XE are the same camera. For motorcyclists, we see the Virb X or XE as extra beneficial simply because of its ease of operation when wearing leather gloves.